As we’ve seen, Louisa Johnson married John Quincy Adams on July 26, 1797, and discovered her father, who went back to America with the rest of her family shortly afterwards, was in debt to the wide and did not pay her dowry of 5000 pounds. According to some sources, John Quincy turned the household accounts, normally handled by a wife, over to his valet and left her feeling that he included her in his disillusionment with her father and family resulting from his being approached by Joshua Johnson’s creditors. 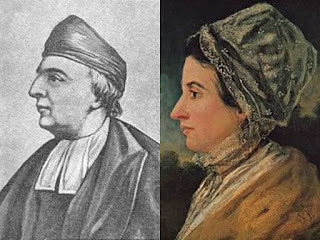 Although they shared some interests, including reading, and were genuinely in love, theirs was a difficult union: two insecure and extremely sensitive people, one of whom considered himself the master, to teach and lead the other (John Quincy) while the other yearned to be a partner with a voice who was not afraid to stand up for herself (Louisa). On top of this, Louisa became pregnant almost immediately. By all accounts, this was a difficult pregnancy; John Quincy’s own diaries make frequent references to Mrs. Adams’ sickness. It is also pertinent to remember that Napoleon was making himself felt on the continent. They finally left for John Quincy’s posting in Berlin on October 18, 1797, requiring a difficult sea crossing and an equally difficult land journey to Berlin which took six days. Shortly after settling into a hotel, Louisa suffered the first of multiple miscarriages almost immediately after their arrival. It was a long-drawn-out and excruciatingly painful ordeal for which the doctors could do little. To his credit, John Quincy was a support and took great care of Louisa during this time, and the situation united them much more closely. They settled into lodgings, and Louisa began her recovery; John Quincy presented his credentials, was presented and immediately began participating in the Prussian court society. Louisa, left to herself in the lodgings, became very lonely as she received no visitors and no invitations, while John Quincy made no effort to have her presented at court. Discovering that Queen Louise was starting to think that John Quincy and Louisa were not married, John Quincy escorted Louisa to the theatre one evening when the King and Queen of Prussia were expected to attend, and Louisa drew considerable attention. Subsequently, she was presented to Queen Louise, with whom she became quite friendly. Close in age to Louisa, Queen Louise was renowned for her beauty and charm, and she was also extremely kind. 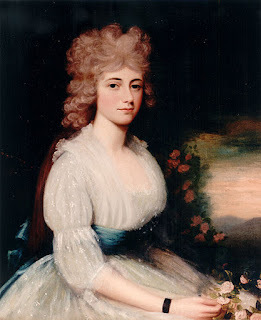 Louisa’s background, between her family’s social activities and her involvement with Anglo-American circles with Mr. and Mrs. Pinckney in London, fitted her to shine in diplomatic society abroad. Her fluent French was also an advantage. Unbeknownst to John Quincy, she became a significant asset to him, especially since diplomacy was (as it still is) conducted in social settings almost as much as in conference rooms. While he was waiting for her to make a mistake and cause him embarrassment, Louisa was busy becoming a success, meeting people and smoothing his way. This would become a recurring theme throughout their marriage. In the meanwhile, John Quincy worried about her acquiring monarchical tendencies, too fond of pomp and circumstances for American tastes (especially his mother’s). Ironically, because John Quincy was the son of the American president as well as an ambassador, they were given a higher place in court protocol than may have been expected. Of course, this meant they had to entertain as well as attend court functions (which meant appropriate apparel for both) on an extremely limited budget and while Louisa continued to experience poor health. She apparently had difficult menstrual cycles and suffered multiple miscarriages which deeply pained her and John Quincy both. It was during this time that she developed the on-going health problems for which she was subsequently know, which included debilitating headaches and fainting spells. In February of 1801, they received news of two painful events: John Adams lost the presidency to Thomas Jefferson, and John Quincy’s brother Charles died. The bright spot came on April 12 of 1801, when Louisa delivered a living son whom they named George Washington Adams, after yet another difficult and painful labour. Although she subsequently suffered a high fever and was very ill, she was recovering when John Quincy and his family were ordered to return to the United States. They left Berlin on June 17, 1801. Louisa was on her way to America, a place she had never visited even though she was a citizen. Apparently, during the trip, John Quincy also told her all about Mary Frazier and his failed courtship, which could not have helped her feel more confident. Upon arrival, John Quincy went to Massachusetts to his family home, and she took baby George and went to see her family in Georgetown, near Washington. The visit was not very happy by all accounts: Mr. Johnson’s financial problems were known, he was in poor health, and John Quincy’s absence was noted. In October, John Quincy came to get her and George to bring them home to John and Abigail Adams’ house. Louisa’s entrance into the Adams’ family was not easy. John and Abigail made no pretence of sincere friendliness; with her foreign upbringing, she felt equally out of place with them. Abigail in particular disapproved of Louisa as a fine lady, and Louisa had no training to be the kind of housewife that Abigail would find suitable. Abigail was also concerned about Louisa’s poor health. Louisa herself was very aware of the differences between her upbringing as an American in England, and felt the differences keenly. Eventually, her intelligence, love of reading and genuine desire for approval won over John Adams and they did develop a close friendship. Her relationship with Abigail was much more difficult, as John Quincy developed a bad habit of discussing his household issues with his mother, then informing his wife of the decisions that he and his mother made. Louisa, of course, would make known her objections, and then ultimately go along. It cannot be a coincidence that her health issues, particularly the headaches and fainting spells continued. They moved into their own home in Boston, but issues did not improve as Louisa did not know how to manage the household, especially as she was expected to participate in the work of the household. Money was, as always , short, and John Quincy kept track of every cent and never hesitated to show his aggravation. John Quincy was extremely busy with his law practice and in May of 1801 became a representative to the state senate. Louisa was left on her own increasingly. In February of 1803, he was appointed to the United States Senate by the legislature. Louisa, pregnant again, discovered she would be going to Washington just when she was starting to feel settled. Their second child was born July 4, 1803 and named John. 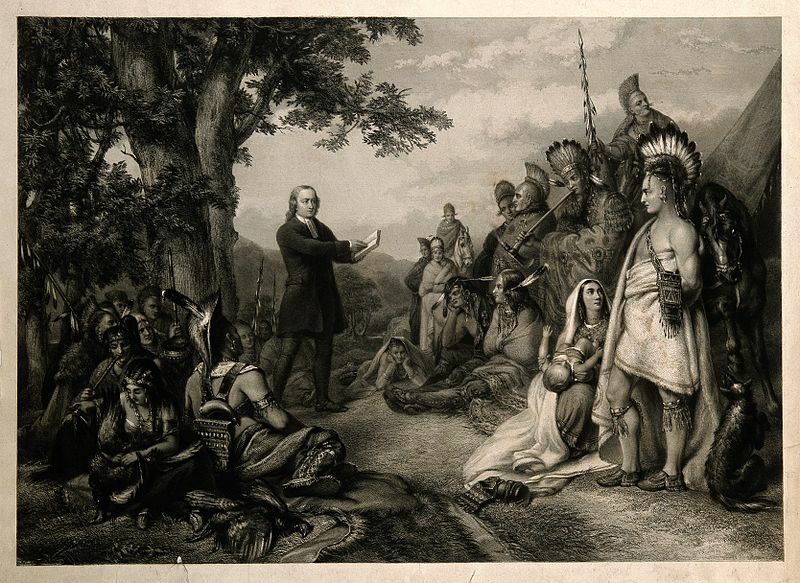 The family arrived in Washington on October 20, 1803. This was the beginning of Louisa’s life as a political wife. Their children were a special bone of contention. In the fall of 1805, John Quincy decided to leave their two sons in Massachusetts, without consulting Louisa and with Abigail’s complicity, while he and Louisa went to Washington. Louisa was upset but went along. In addition to missing her children, she was experiencing a difficult pregnancy. Because of her pregnancy, John Quincy left her in Washington when he returned to Massachusetts for the summer (now without him AND her children). Sadly, her pregnancy resulted in a still birth. Louisa finally made it home to Massachusetts in August 1806. The next term of Congress, she and the children stayed in Boston in miserable lodgings, again without consultation with Louisa. Clearly, John Quincy had no intention of allowing Louisa a voice, even though he consulted regularly with his mother. Equally clearly, Louisa made her anger at being so treated known, but went along anyway. During the summer of 1807, Louisa was pregnant again and she gave birth to a third son after yet another excruciating labour (the baby, named Charles Francis, was breech). When John Quincy took his family back to Washington for the 1807-1808 term, she was allowed to take the new baby; the two older children again stayed behind, this time boarding with John Quincy’s aunts (Abigail’s sisters) individually (George with Elizabeth Peabody and John with Mary Cranch). Louisa submitted, but not happily, and she did not agree that child rearing by proxy was good for her children. Given the number of miscarriages she had and the difficult labours she experienced, her attachment to her living children must have been particularly intense. Increasing political activity stemming from tension with Great Britain took John Quincy away even more and resulted him changing parties from the Federalists to the Republicans in support of Thomas Jefferson and James Madison. This resulted in his resigning his Senate seat and the family returning again to Boston in 1808, only to face social ostracism. Even John and Abigail Adams were upset about his change. He went to Washington to conduct three cases before the Supreme Court, again leaving Louisa and his children behind. She had become pregnant again but lost the baby early in 1809 while John Quincy was away, when she slipped and fell on ice. They had argued before he left, and conducted a bitter exchange of letters, even after the miscarriage. In July of 1809, the Madison administration offered John Quincy the position of minister plenipotentiary to Russia, which he accepted. Despite their friction, John Quincy wanted Louisa with him. He made arrangement, again with Abigail, to leave the two older boys with an aunt and uncle, while Louisa and little Charles accompanied him. There is no indication Louisa had any participation in deciding who would go with them and who would stay behind. This time, Louisa’s sister Kitty was among the party to go so at least she had a family member with her when they took ship on August 5, 1809, beginning an eighty-day voyage. Their arrival was difficult, as they had only the clothing they stood up in as, after they got off the ship in Kronstadt, it floated back out to sea with all of their belongings. They had to go on to St. Petersburg. The beginning of John Quincy’s mission was not going well: the drinking water had affected everyone (diarrhea), and they discovered that their luggage had been ransacked when it was finally returned. Again, as an ambassador, John Quincy and his wife were expected to be part of the social scene and, again, John Quincy was focused on their lack of money. Even though he was much more than he had been in Prussia (Louisa Thomas indicates only the president was paid more ). 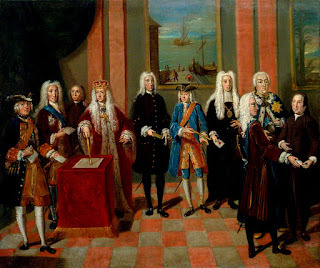 Unfortunately, the Russian court was vastly wealthier, the social duties were heavier (almost nightly), and the entire party needed complete new wardrobes-they had to keep up with the Joneses with a vengeance, so to speak. John Quincy’s assignment included fostering good relations with the Russians and there was no way for him or for Louisa to evade their social responsibilities. The expenses of daily living, combined with the costs of wardrobe suitable for court brought Louisa’s anxiety about her dowry to the forefront again. However, in spite of the financial hemorrhage resulting, Louisa enjoyed parties and dancing. She did not enjoy the high status she had held in Prussia (thanks largely to her friendship with Queen Louise) but did succeed in charming the Russian court and once again being an asset to John Quincy. The high-waisted flowing style we now associate with the Regency era in England was popular in Russia, and Louisa became very creative in stretching her and Kitty’s wardrobe funds as much as possible, not least in sewing their own gowns. Both John Quincy and Louisa bemoaned the exorbitant costs of living in Russia at this time, while carrying out their duties. Louisa suffered another miscarriage in February of 1810, but got back into her routine as quickly as possible. In the spring of 1811, John Quincy was offered a position on the Supreme Court. However, he declined, using the fact that Louisa was pregnant as an excuse. On August 11, after an uneventful pregnancy and labour, she delivered a little girl, who was named after her mother, Louisa Catherine. Louisa and John Quincy were both entranced with their daughter. John Quincy had sent for their sons in March of 1812, but war being declared with Great Britain, their trip was postponed indefinitely. The vast distance delayed news between the United States and Russia, and Louisa was much more experienced with separation from her family and children, so she was able to take comfort of Charles and Louisa Catherine. Sadly, Louisa Catherine became ill and, after a long illness died September 15, 1812, the same day Napoleon rode through Moscow. Both John Quincy and Louisa were devastated by her death. John Quincy was able to find some comfort in his work, but Louisa’s grief did not abate. John Quincy’s response was to buy her a book by Benjamin Rush, MEDICAL INQUIRIES and OBSERVATIONS, UPON DISEASES of the MIND. Not exactly a sensitive gift. She blamed herself for her child’s death and missed her two sons left behind more than ever; these feelings rekindled her anger with John Quincy. He was relieved when he asked to be part of a peace commission, which resulted in his departure April 28, 1814 and which was to keep him away for several months, leaving Louisa and Charles in St. Petersburg. Her health was never robust. Ironically, during her time in Russia, Louisa and her mother-in-law drew closer than they had ever been by letter. John Quincy’s departure left Louisa in complete charge of the household, while expecting her to maintain her social responsibilities. After years of not being allowed to handle anything, it is not unreasonable to assume that Louisa doubted her own abilities. However, she rose to the occasion and even enjoyed being in charge. Their letters indicate that they seem to have reconciled their differences at least to some extent, and showed a mutual affection. However, the prospect of yet another Russian winter, this time with John Quincy away, put a further strain on her. The peace commission took longer than anyone anticipated, but peace with Great Britain was finally concluded in December 1814. At that point, John Quincy dropped a bombshell on her: he informed her that he would not be returning to Russia and ordered her to sell everything she did not want to keep for the best price possible, and bring their son to join him in Paris as soon as she was able. This put Louisa in position for a journey that was a defining experience in her life, and an illustration of the strength and character of this fascinating woman. Part IV will discuss Louisa’s journey from St. Petersburg to Paris, her further career in Washington as the wife of Secretary of State and as First Lady, and our conclusion. Thomas, Louisa. 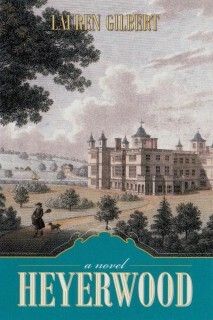 LOUISA The Extraordinary Life of Mrs. Adams. P. 172. Caroli, Betty Boyd. THE FIRST LADIES from Martha Washington to Michelle Obama 4th edition. New York: Madison Park Press (an imprint of Direct Brands, Inc.), 2009. Heffron, Margery M. LOUISA CATHERINE The Other Mrs. Adams. New Haven: Yale University Press, 2014. Roberts, Cokie. LADIES OF LIBERTY The Women Who Shaped Our Nation. New York: HarperCollins, 2008. Thomas, Louisa. LOUISA The Extraordinary Life of Mrs. Adams. New York: Penguin Press, 2016. Withey, Lynne. DEAREST FRIEND A Life of Abigail Adams. New York: Touchstone/Simon & Schuster, 2001 (originally published 1981 by the Free Press). About the author: Lauren Gilbert is the author of HEYERWOOD: A Novel, released in 2011. A second novel A RATIONAL ATTACHMENT is in process. She lives in Florida with her husband, with some roses (white ones are blooming) and gardenias, herbs and pineapples. Please visit her website at www.lauren-gilbert.com for more information. The EHFA Editors hope you enjoy this week's articles from the blog. 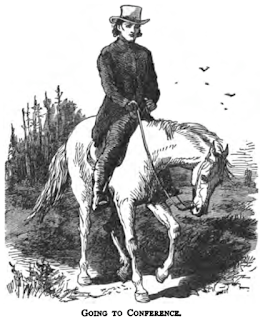 Had you been strolling a country road, in the early 1740s near Bristol or London, you may have observed John Wesley approaching on horseback. He’d have been oblivious to your presence with his face pressed close to his bible and reins laying slack across the horse’s neck. 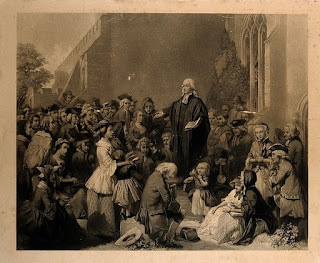 It may have been difficult to see in him, the man who’d withstand persecution by the Church of England, argue passionately for prison reform, or urge William Wilberforce to continue in his struggle to end slavery. But he did these things and more. John Wesley, father of the Methodist Movement, spurred the faith of people – across England, Ireland, America and the Caribbean – by teaching that religion was meant for everyone regardless of social class and wealth. His teaching methods shadowed the same disciplined approach he applied to his own spiritual life. He strove not to create a new religion, but rather a new way of being Anglican, the church of which he was an ordained minister. Born July 1703, John was the fifteenth child of Samuel and Susanna Wesley. Through their example, he became a devout man and an independent thinker. In September 1684, John’s father registered as a “Pauper Scholar” at Exeter College in Oxford, tutoring fellow students and serving their evening meal in order to finance tuition fees. Even as a Church of England clergyman, financial woes plagued Samuel Wesley. His loyalist politics, controversial poetry publications and delivery of verbose academia from the pulpit failed to interest parishioners. The relationship between John’s parents was often stormy. His mother stood her ground in the face of marital disagreement, stating that “since I’m willing to let him quietly enjoy his opinions he ought not to deprive me of my liberty and conscience.” John’s father often sought refuge by traveling to London. During one of Samuel’s absences, Susannah took dissatisfaction in the curate’s performance. She took the spiritual well being of her ten children in hand by conducting Sunday evening prayers that quickly expanded into sessions of worship. The rectory floor was soon filled with 200 worshipers, far exceeding the attendance of Sunday morning services. Samuel wrote to Susanna and requested that she give up her activities. She promised to desist, as an obedient wife, but warned Samuel that he would be responsible for these souls in need of saving. 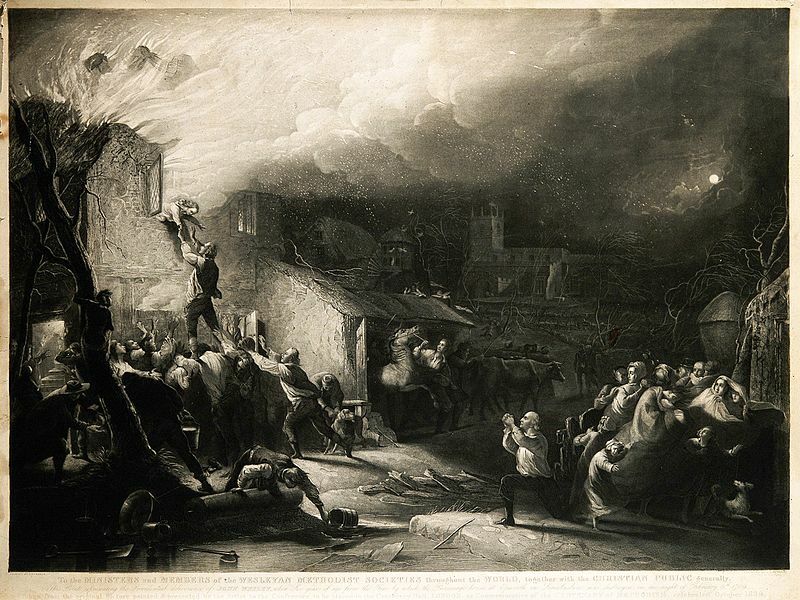 John was only six years old when he awoke one February evening in 1709 to discover himself surrounded by flames. His family had been fully evacuated from the Epworth rectory, but it was only after taking a headcount that his parents realized he was missing. The fire’s heat prevented rescuers from reentering the house. John climbed onto a desk and shouted through a window. Onlookers formed a human ladder and boosted Samuel close to the window and John leapt into his arms. Seconds later, flaming timbers crashed into the room. 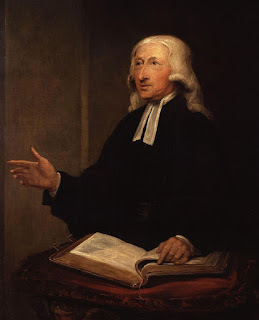 In 1715, at the age of ten, John Wesley left the rigours of his mother’s home schooling program for enrolment in Charterhouse School where he would spend the next six years. 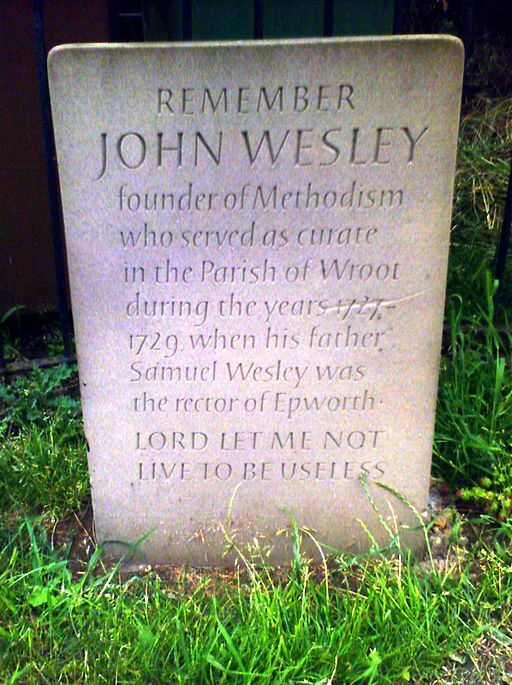 He was nominated for pauper scholar status by the Duke of Buckingham, lord chamberlain to King George and the patron credited with sustaining the Wesley family at Epworth. Following Queen Anne’s death that same year, Britannia’s enemies plotted for the return of a Catholic King. A failed rebellion in the Highlands led by the Earl of Mar, paved the way for the Whigs to label every Tory a traitor. The church became a place not for prayer and ministerial duties, but rather an opportunity for patronage and self-promotion. In his adult years, John Wesley would observe this system with disdain. In that same year, his brother Charles joined him at Oxford. Together they discussed ways of living, praying and thinking in order to develop strict practices for a more holy life. Charles formed a group of students whose focus was to pray and study scripture. Fellow students mocked them by dubbing them the Holy Club. After a stint of working at his father’s parish, John returned to at Oxford and took over the running of the club. He operated it in near monastic style, with members fasting and taking communion each week. The Wesley brothers involved the group in aiding the unfortunate through prison visits, giving alms to the poor, organizing education for young children and a loans system of that enabled local tradesmen to purchase necessary tools. John became an ordained priest of the Church of England in 1728. 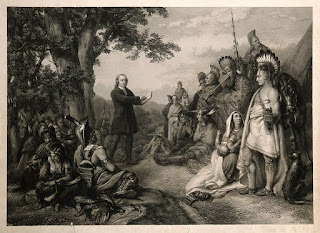 Seven years later, he and Charles set sail for Savannah, Georgia, in America, with plans of converting natives to Christianity. On the crossing to America their ship, The Simmonds, encountered a violent storm during which John made an important self-discovery. He lacked faith. 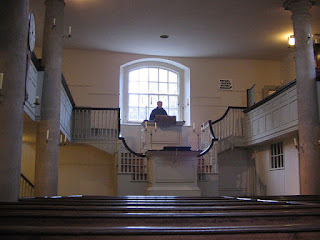 Below deck, a group of Moravians continued their quiet worship. When John enquired after the source of their calmness, they answered that they were unafraid of death because salvation through grace was for anyone who would chose to follow Christ. John traveled to Germany along with friend and Moravian, Peter Böhler, on a quest to understanding Moravian beliefs. Böhler observed that John was ruled not by his head, but his heart, owing to his focus on strict practices. He recommended that John preach faith until he had faith. During a Moravian bible study, John experienced the spread of a warming sensation through his heart and he was filled with faith. He felt compelled to share salvation through grace with others. While he preached that man determined his fate, the church protected its Calvinist view by turning him away from their pulpits. He reunited with George Whitfield, a Holy Club friend, who invited him to preach in the open air. The idea repelled John. The Church of England frowned upon the conduct of services outside of church walls. In 1739, John arrived in Bristol to attend Whitfield’s sermon in a field. He moved to preach at his own open air meeting two days later with tremendous results. The outdoor meeting sites were not the rolling grassy meadow of a romantic novel, but rather dangerous locations like mines and brickfields where people battled for their very survival. In the absence of social welfare, schooling, and healthcare, people were considered a resource to be used up and tossed aside. Children toiled underground. The average life expectancy was 30 years old. Audiences flocked to hear this never before heard message – God’s love was inclusive and they had only to believe in him to access heaven. Religion had never been extended to their class. Pew rents and lack of appropriate raiment prohibited their church attendance. 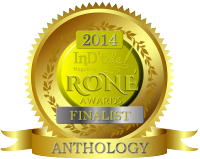 Gwen Tuinman is a novelist, born and raised in rural southern Ontario, Canada. She currently lives near Toronto with her husband and two chickens. Gwen's storytelling is influenced by an interest in bygone days. She is nearing completion of her current novel, set in a dying paper mill town, and preparing to begin a second, involving characters pitted against the rugged Canadian forests of the 1800's. Her short fiction has been included in The Renaissance Anthology, and has been featured in an exhibit at The Robert McLaughlin Gallery. Research and reflections relative to her works in progress can be found at gwentuinman.com. Connect with Gwen on Facebook, Twitter (@GwenTuinman), Instagram, and Pinterest. 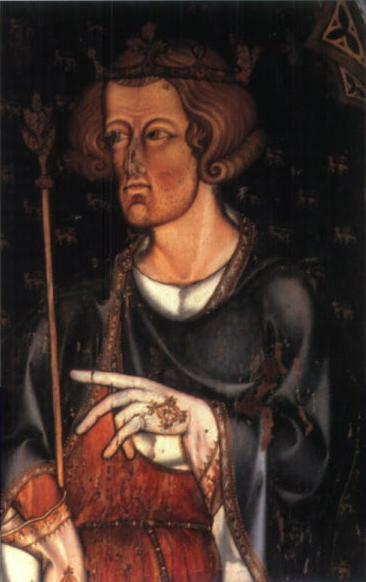 Gilbert de Clare (1243 to 1295), also known as ‘Gilbert the Red’ because of his hair colour and fiery disposition, was the seventh earl of Gloucester and sixth earl of Hertford. He was born at Christchurch, Dorset, on 2nd September 1243, the eldest son of Richard de Clare, earl of Hertford and earl of Gloucester (1222–1262). The Clare’s owed their leading position in the English nobility to royal favour, inheritance, profitable marriages and a certain belief in the adage that ‘Might is Right’. 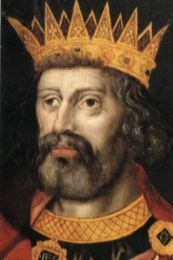 In 1252 and ambitious to increase his family's standing and encouraged by King Henry III, who wished to strengthen relations between the crown and the nobility, Gilbert’s father arranged the marriage of Gilbert to the king's niece Alice for a dowry of 5000 marks (that’s around £800,000 in today’s money). In the spring of the following year Earl Richard and William de Valence, the king's half-brother, accompanied Gilbert, then aged nine, to Poitou to solemnize the marriage. As you can see, Gilbert was born with more than a silver spoon in his mouth; he had a complete silver service clamped between his young jaws! In 1262 aged twenty, Gilbert inherited his father's estates and took on the titles, including Lord of Glamorgan. 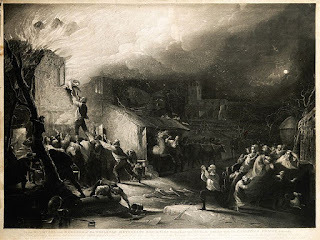 The Second Baron’s War saw Gilbert ally himself with Simon de Montfort and in April 1264, Gilbert emulated his leader by massacring the Jews at Canterbury, (just as Simon de Montfort had done in Leicester). Not being best pleased with the young impetuous earl, King Henry took Gilbert’s castles of Kingston and Tonbridge but Henry allowed de Clare's wife Alice de Lusignan, who was in the latter, to go free. On the 12th of May 1264, de Clare and de Montfort were declared traitors. Two days later, on 14th May, Simon de Montfort knighted Gilbert and on that fateful day at Lewes the battle between Barons and Royalists commenced. In theory King Henry and his illustrious son Lord Edward (the future Edward the First) should have won the battle of Lewes. Gilbert commanded the central division of the Baronial army, Lord Edward the right wing of the Royalists. When Edward left the field in pursuit of Montfort's routed left wing, comprising of Londoners, the King and Earl of Cornwall were thrown back to the town. Henry took refuge in the Priory of St Pancras, and Gilbert accepted the surrender of the Earl of Cornwall, who had hidden in a windmill. Montfort and Earl Gilbert were now supreme with both the King and his son under arrest. Simon de Montfort was now the de facto King of England. To put it into context, Gilbert had at first supported the King then he changed sides. Not a man to be trusted eh? In November the same year (1264) Gilbert removed his metaphorical Baronial hat and put on the Royalist one when he changed sides yet again to support Henry and Lord Edward. So it was that on August 4th 1265 at the battle of Evesham, Gilbert led the left wing of Lord Edward’s army and de Montfort was slain. Gilbert certainly knew how to pick a winner didn’t he? The battle of Evesham was also known as ‘the murder of Evesham’ as Edward went against the rules of chivalry and slaughtered even those attempting to surrender – Gilbert did his fair share of blood-letting. This second baron’s war didn’t end at Evesham as rebels held out all over the land. In September 1265 at the Parliament of Winchester the rebels were disinherited and their lands given to royal supporters. In April 1267 a certain Sir John de Deyville  and his men would not accept the dictum of Kenilworth  proclaimed on 31st October 1266 (this stated that the rebels had to pay their dues for their part in the wars). But Sir John needed a backer and guess who rode to his rescue? Correct: Gilbert de Clare! Our recalcitrant Earl changed side again and took his troops to London in defiance of King Henry and Lord Edward. Gilbert had the idea that whoever controlled London (and especially the Tower) controlled the realm. 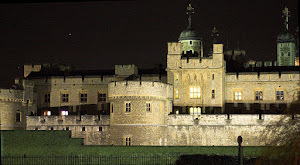 King Henry was at Cambridge and Edward at Windsor when news reached them that Gilbert had entered London. The Londoners had no love for Henry and thought themselves a cut above the rest of England’s populace. Gilbert was welcomed with open arms and once again rebellion reared its ugly head. To be fair to Gilbert, his stated aim was to lighten the burdens imposed on the rebel knights and barons. He sought to use his occupation of London as a bargaining tool. Some say he had delusions of grandeur and thought to start another full-blown rebellion but, personally, I think his intentions were true. A certain Cardinal Ottobuono (Papal Legate)  occupied The Tower of London at the time and Gilbert set about laying siege so as to gain the Tower and cement his hold on London. Gilbert also tore down houses and set up defences on the South bank of the Thames at Southwark for he assumed that Edward would attack from this direction. Eventually Cardinal Ottobuono relinquished the Tower and set up residence at Stratford some miles East of the city. With the Tower in his control Gilbert naturally assumed his demands for reform were a certainty but – there’s always a ‘but’ isn’t there – he hadn’t taken the behaviour of Sir John Deyville in to consideration. If we accept that Gilbert’s occupation of London was undertaken with the best of intentions; to seek redress for the Disinherited knights and Barons, to right what he considered a wrong in their treatment then Sir John Deyville’s intentions were completely the opposite. Sir John and his men basically ran amok through London. 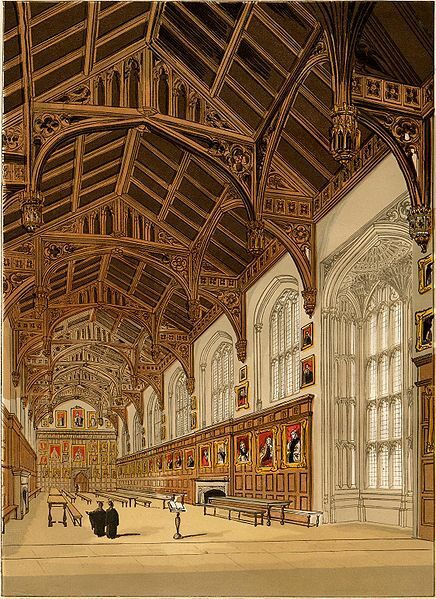 He even occupied Henry’s favourite Palace of Westminster and, not content with plundering anything of value that could be moved he even took away doors and windows! When King Henry heard about this he vowed dire revenge on the avaricious knight. Even the Londoners complained about Sir John and his followers who took drink, food, lodgings and even the local women of easy virtue without paying for them; the Londoners were becoming disaffected; the tide was turning. Then came news that the Royal army was on its way. Gilbert expected a direct attack but King Henry and Lord Edward took their forces to the Abbey of St Mary's, Stratford Langthorne where they met up with Cardinal Ottobuono. With an army almost on their doorstep the Londoners realised the game was up and supporters drifted away from Gilbert. More men flocked to the Royal banner at Stratford where, unbeknown to Gilbert, Lord Edward had taken charge and Edward wanted a fight. As Gilbert left London there was a final ignominy for him to endure. He had to relinquish Tonbridge Castle and/or his daughter and pay a fine of ten thousand marks. And Sir John Deyville? He was eventually pardoned and went on to redeem himself. Did Gilbert de Clare ever change sides again I hear you ask? Well not specifically. 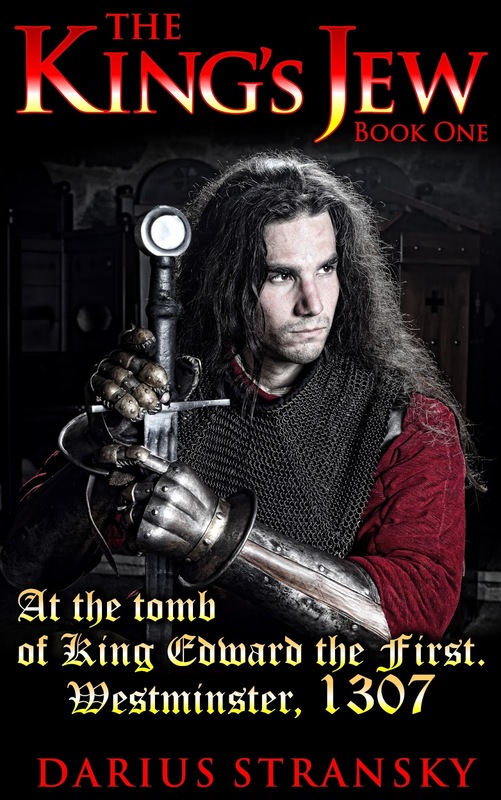 He did promise to accompany Lord Edward on Crusade but never actually fulfilled his pledge. He was constantly falling out with Edward and sailing close to the wind in his dealings with royalty (it was rumoured Edward had a dalliance with his first wife Alice but that’s another story). Gilbert was the first to accept Edward as King when Henry died in 1272 whilst Edward was on crusade. So that was a good move. Eventually Gilbert married Edward’s daughter Joan of Acre  but even then Edward had the last laugh for it was written that when Gilbert died all his lands and property would revert to Joan and thus back to the Crown. Gilbert Died: 7th December 1295 at Monmouth Castle, Monmouth. In conclusion: It is my opinion that Gilbert’s occupation of London in 1267 did indeed achieve his aims and that further opposition to the Crown was defused thanks to the changes he obtained. Darius Stransky wrote weekly columns and articles for prestigious UK media groups for many years. He then immersed himself in thirteenth-century English studies and thus was born ‘The King’s Jew’ series. Stransky’s ‘The King’s Jew Quartet’ is an adventure, a love story and a tale of intrigue and passion set against the backdrop of Edward the First and spans sixty-seven years of Cristian’s and Edward’s life together. Importantly, the life of the medieval Jew and the common man is not overlooked in this sweeping saga. Louisa Johnson’s family was known to the Adams family, a family on a level with nobility in the fledgling United States of America. John Quincy’s parents, John and Abigail, were in London and Paris between 1784 and 1788, when John was the first ambassador to Great Britain. Although not yet consul, Joshua and his wife would have been part of the Anglo-American society with whom John and Abigail would at least have been acquainted. Previously, John and John Quincy were known to have met up with the Johnson family while they were sojourning in Nantes in France. There is no indication that John Quincy and Louisa had any prior acquaintance themselves (she was much younger). They met when John Quincy was ordered from Holland to London to help with an official act. Due to travel delays, John Quincy did not arrive in time; business was concluded without him. He was kicking his heels, waiting for orders to return to his duties as resident minister of Holland, when he found his way to dinner at the Johnsons’ house. There he resumed his acquaintance with Mr. and Mrs. Johnson and enjoyed the society of their family and friends. He was considered a handsome young man, and a portrait of him can be seen HERE. Before we go further, it is important to understand a bit about both of these individuals. Louisa had strong ideas about marriage and a woman’s role. She viewed her parents’ relationship as idyllic, reminiscing about how her father had adored her mother and catered to her. At the same time, her father also espoused a very traditional role for women, in the home and subordinate to her husband. (This was still a time, when a couple married, the two became one and the man was the one.) Louisa’s own reading and thinking led her to want more. She wanted a voice in her life and decisions affecting her, and she wanted the kind of marriage that she thought her parents had. Louisa was also rather insecure about many things. She considered her older sister Nancy to be the belle and beauty of the family. Quite slender, almost unfashionably so, with large dark eyes, she did not consider herself particularly attractive or talented, although accounts indicate otherwise. Most of all, she felt compelled to hide her intelligence and her desires, as she did not believe men would be attracted to those attributes. The traditional duty of a woman of her time and status was to marry as well as possible to please her parents. In many respects, she was spoiled; in others, she was stifled. John Quincy, as the son of John and Abigail Adams, was raised to be an achiever. His parents planned his education and career and made the decisions at all levels. Both parents pushed him hard to excel in his studies. His career path was to study law and follow in his father’s footsteps. The trouble was he was not particularly interested in the law, nor did he particularly want to follow his father’s path into public service. His father’s work and the war caused frequent separations, and both parents wrote frequently about the importance of his studies, his duty to his family and his country, and setting forth the high expectations they held for him. He became insecure, feeling that he could never fully meet their expectations, and frustrated because he did not trust his own preferences and desires. He loved and respected his parents but also felt resentment for their constant pressure and control over his life. (He seems to have had especially mixed emotions for his mother; she was a very strong woman who made decisions and had a strong partnership with her husband. He loved and admired her, but also seemed to have resented her influence and strength.) As an adult, he was torn between what he felt he ought to do in terms of continuing his studies and pursuing his work versus the things he wanted to do. Leisure was a particularly difficult issue for him. He enjoyed parties and society and felt guilty for indulging in leisure activities. He felt he could never live up to his parents’ expectations for him and did not always trust his own abilities. He had been in love with and wanted to marry a girl named Mary Frazier and gave her up at the insistence of his parents, a sore point for the rest of his life. So John Quincy joined the Johnson family for dinner and became a regular in their society. He did not appear to pay particular attention to any of the girls but, in time, he mentioned her by name in his diary expressing his appreciation of her singing. He was present socially on a frequent basis, including his attendance at Louisa’s older sister Nancy’s birthday ball in November 1795. Many people (including Louisa, apparently) believed he was courting Nancy (a logical assumption given she was the elder and considered the beauty). Catherine Johnson was pleased by the prospect, although there were indications that Joshua was not, given his desire for his daughters to marry Americans from the south. A ball for Louisa’s upcoming 21st birthday was held January 27, 1796, and John Quincy made his interest in Louisa known. This caused a serious upset in the family, given that Nancy considered him to be courting her as did many other people, and no one had any inkling it was Louisa to whom he was attracted. Nancy was angry and humiliated, and she took it out on Louisa. Then, having made his interest known, John Quincy did not appear to be disposed to do anything more about it. While Catherine was in favour of the marriage, her father seemed resigned (financial problems made husbands for his daughters very attractive). However, having declared his intentions, John Quincy did not propose marriage. He was due to return to his duties in Holland and, despite spending more time with the Johnsons than ever, seemed almost to hope to get away. Finally in April, Catherine Johnson demanded a meeting with him and insisted on knowing his intentions. John Quincy, despite his apparent reluctance, and Louisa became engaged, and Joshua promised her dowry of 5000 pounds. However, John Quincy insisted on returning to Holland (he was ordered to return in May) without being married, and that he would not marry Louisa until his appointment was concluded and he was able to resume his law practice and was able to support her; in other words, they were engaged but had no definite plans to marry. At this time, long engagements were not the norm. This situation left Louisa in an uncertain state, insecure about his affection and facing the possibility of estrangement in time. John Quincy returned to Holland, unmarried, while Louisa resigned herself to wait. John Quincy and Louisa began a correspondence. Both of them were short tempered, insecure and uncertain of the future. They meant to be agreeable to each other. He told her his plans and expectations; she tried to mould herself accordingly. They tried to be romantic, but were unable to find a real connection. Then, John Quincy was appointed minister to Portugal. To Louisa, this seemed an opportunity for them to marry; he could stop in England on the way to Lisbon, they could marry, he could take her with him. This was not an acceptable plan to John Quincy. The concern about supporting her was the same. However, she also felt his letters implied that he did not truly feel she would be a suitable wife for him. In the meanwhile, Joshua was facing extreme financial difficulty and planned to take his family back to America that summer, and John and Abigail Adams were writing letters to John Quincy deploring the marriage. They counselled delay, to wait til his prospects were more settled. Abigail felt that Louisa was too European and would not fit in as an American, even though naturalized. That did not faze John Quincy, so the tactics changed; John and Abigail expressed concern that time in a European court would corrupt her, turning her into a monarchist, so they discouraged his taking Louisa with him to Lisbon. Louisa asked if they could at least see each other, even offering to come to Holland with her parents. Unfortunately, John Quincy responded by accusing her of planning to be left behind in Holland, basically trapping him. Frequent correspondents, letters flew back and forth, neither waiting for a response before firing off another. Harsh words were exchanged, and each gave the other the opportunity to break it off. However, making it clear that his first obligation would always be to his country, John Quincy came to England July 12, 1797. John Quincy had made it clear that Louisa would never be his first priority, and it showed when he did not visit her until the day after his arrival. To his surprise, when he asked Louisa to set the wedding date, she selected a date two weeks away. She felt insecure and wanted to get it done. (Her father was also in a hurry, as his finances required that the family return to the United States as soon as possible; marrying Louisa off would mean one less person to transport and feed.) John Adams was, by now, President of the United States, and he threw a further monkey wrench into their plans by changing his appointment from Portugal to Prussia, a more prestigious position. John Quincy deplored nepotism, but took the appointment anyway, not least because it was troublesome to him. (He seemed to feel a particular virtue in annoyance and struggle.) He had already had his possessions shipped to Lisbon. Louisa and John Quincy were finally married on July 26, and they celebrated for several weeks, concluding in a ball given by Louisa’s father on August 25. John Quincy and Louisa moved to the Adelphi Hotel to stay til their departure for Berlin in October. Her family joined them for dinner on September 8, which turned out to be a farewell, as Joshua was taking the family to the US immediately (earlier than planned), the result of a financial disaster about which Louisa knew little or nothing. They left the hotel and went straight to the ship. Then Louisa discovered that, in addition to leaving her without warning, he had not paid her dowry to John Quincy, a violation of their marriage agreement. This was a serious blow, as she felt that John Quincy and other people would assume she knew that her father would not pay. John Quincy had always been concerned about money, and her father’s default and the subsequent scandal put her in a embarrassing and difficult position, especially when creditors appeared at their hotel. The timing was especially bad, as John Quincy had left his savings with his brother Charles to invest, and Charles had lost it. John Quincy received a letter from a colleague of Mr. Johnson's, implying that John Quincy had knowledge of Joshua’s failure, and gave the letter with his reply to Louisa to read. The whole situation left her shattered and humiliated. Part III will continue with their married life. Their marriage would last fifty-four years. Roberts, Cokie. LADIES OF LIBERTY. New York: William Morrow (an imprint of HarperCollins Publishers), 2008. Withey, Lynne. DEAREST FRIEND A Life of Abigail Adams. New York: Touchstone (trademark of Simon and Schuster), 1981. Caroli, Betty Boyd. THE FIRST LADIES From Martha Washington to Michelle Obama, 4th edition. New York: Madison Park Presss, 2009. Image of Louisa: Wikimedia Commons HERE. About the author: Lauren Gilbert is the author of HEYERWOOD: A Novel, released in 2011. A second novel A RATIONAL ATTACHMENT is in process. She lives in Florida with her husband, with some roses and gardenia, herbs and pineapples. Please visit her website at HERE. Some buildings are more than just the wood and timber that makes up their frame; more than the collection of rooms that make up their space. They occupy a place in history. Imagine a thousand year old building, with its use and purpose changing with the tides of history. Worcester’s Commandery, with its millennium of social, political, religious and industrial history, is such a place. The Commandery is situated just outside the old city of Worcester, where once the Sidbury gate once stood. The Commandery started out as a monastic hospital, founded by the Order of the Knights of the Hospital of Saint John of Jerusalem (the Order of Hospitallers), offering relief and shelter to travelling pilgrims. The Knights Hospitallers had many such hospitals scattered throughout the world which were centres of administration and healing. They were specifically built outside the city gates to be able to greet pilgrims who arrived after nightfall, long after the gates were shut. It’s very likely that the original site was originally occupied by an 11th century chapel dedicated to St. Godwald (possibly a Welsh hermit bishop also known as Gulval), but in the year 1203, the chapel was rededicated to St. Wulfstan, who had been canonized the same year. 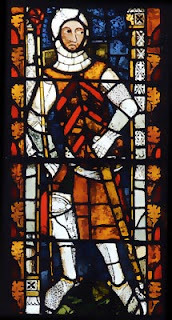 St. Wulfstan was an Anglo Saxon bishop who had been given the bishopric of Worcester a few years before the Norman conquest and who had managed to hold onto the diocese in the years following the conquest. St. Wulfstan had been associated with healing which suited the purpose of the Commandery. One maimed man claimed that St. Wulfstan had healed him, even to the extent of regenerating dear body parts. The image of the saint was also one of the elements of King John Lackland’s tomb, pictured riding the shoulder of the king’s effigy. During the 13th century until the early 16th century, the Commandery served as an important centre of healing and prayer. The monastery housed a Master, two chaplains and several lay people. 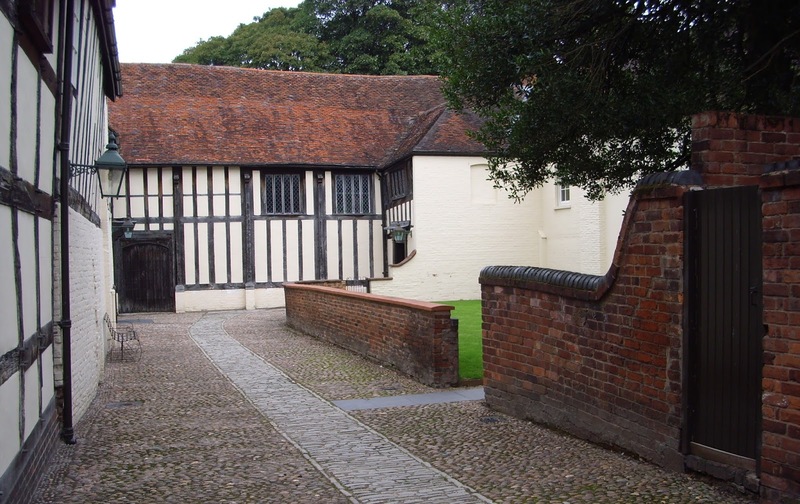 Between the years 1480 and 1540, the Commandery was completely rebuilt and expanded into its present Tudor daub and wattle design. Two of its famous features date back to the this time: the Great Hall with the minstrels’ gallery above, and the Painted Chamber. The Great Hall occupies the centre of the Commandery and opens up off the main courtyard. 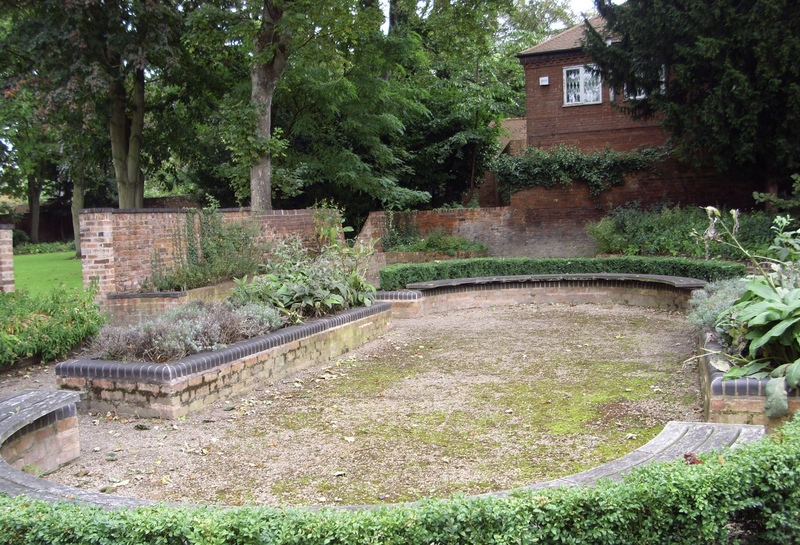 Most of the floor is a black and white chequerboard pattern while a smaller section is red brick cobbles (at one point used as part of a carriage driveway); both design elements date back to the Victorian era. There is a special medieval stained glass window known as the Oriel window, which depicts plants, a peacock and camel. 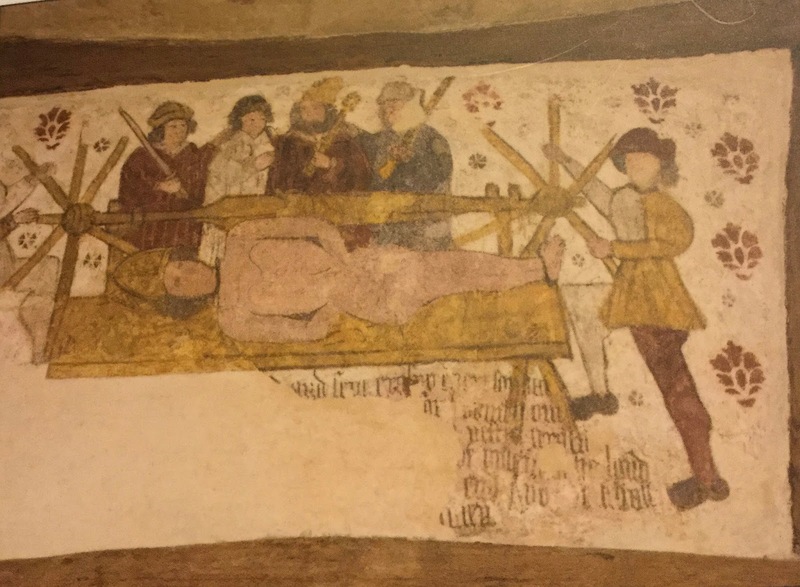 Given that the building was once owned by the Knights Hospitallers, one could imagine that these exotic images were a fond nod to their travels in far away lands. The Painted Chamber is one of my favourite rooms in the Commandery. There’s a feeling of calm and peace when you stand inside and look at the paintings on the wall, which is where it gets its name. The chamber dates back to the end of the 15th century, and is considered to be either a sick room or a quiet place for prayer. I’ve no doubt that during the Commandery’s history, the room was used for both. 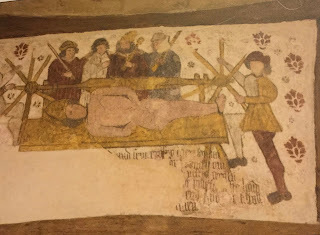 The paintings include images of St. Erasmus, the patron saint of abdominal pain, and St. Thomas a Becket, the patron saint of priests. There is also a scene of weighing of the souls, a painting that suggests contemplation; on the ceiling there is a painting of the Trinity. No doubt, recuperating invalids would gain comfort when they stared at the ceiling. 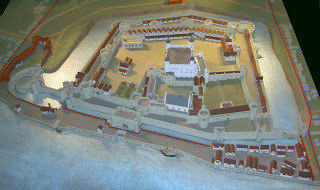 The Commandery would have likely continued as a monastic hospital were it not for King Henry VIII and the Reformation. With the Reformation came the dissolution of the monasteries, courtesy of Thomas Cromwell. Plum church properties and lands were now handed out to loyal supporters. One close friend and protege of Thomas Cromwell, Richard Morrison, was given the mastership of the Commandery and other monastic hospitals in 1540. Morrison eventually became an ambassador to the German court of Charles V during King Edward VI’s time. A few short years after being given the Commandery, Morrison sold the Commandery to a Thomas Wylde in 1545. Wylde was a prosperous Worcester clothier whose fortunes were on the rise. A short time after purchasing the Commandery, Wylde served as bailiff, a councillor and eventually became a Member of Parliament for Worcester. It was during this period that the old chapel would have been demolished and the house expanded to include a new kitchen. It was also at this time when the Painted Chamber was plastered over. The paintings would have to wait to be discovered four centuries later when the Commandery underwent a refurbishment. The Wylde family continued to own the Commandery through it’s most turbulent period—the English Civil War and one chapter of this engagement rage immediately outside the Commandery’s doors. Ironically, it also involved another Cromwell. The first two civil wars were from 1642 to 1648 and ended when King Charles I was executed on Jan 29, 1649. His son and heir, Charles Stuart, launched a bid to reclaim his father’s throne and made an alliance with Scotland. On August 22, 1651, King Charles II and his Scottish army of 12,000 - 14,000 strong marched into Worcester, the end of a nearly three week trek into England. The Parliamentarian army, led by Oliver Cromwell, were closing in on them and the Royalists knew they wouldn’t be able to reach London as they had at first hoped. Worcester had always been a loyal royalist town and it had a number of natural features to make it defensible, including Fort Royal Hill which was immediately behind the Commandery. While Charles II may not have been quartered in the Commandery, it was most likely that many of his senior officers, such as the Duke of Hamilton, had been. On the morning of Sept 3, 1651, the battle began and some of the hottest fighting occurred just outside the Commandery. The royalists were outnumbered two to one and by the end of the day, they were in retreat. The king managed to escape into the city through the Sidbury gate and joined other fleeing fugitives to escape from the city. The Duke of Hamilton took a shot to the leg and was carried back to the Commandery. They tried to treat his injuries in one of the main floor rooms, but his wounds were grave. He refused to accept the assistance of Cromwell’s surgeon and died nine days later. His final resting place is in Worcester Cathedral. The Commandery was thankfully not destroyed or ruined during the battle and remained in the Wylde family until the mid-18th century. In 1764, the Wyldes sold the estate to John Dandridge, a Worcester lawyer and land developer. He didn’t need the entire sprawling estate and had the clever idea of subdividing the property and leasing it out in parts, an arrangement that continued into the 20th century. In 1866, the College for Blind Sons of Gentlemen leased out some of the premises until 1888. At that time, the last owner, Joseph Littlebury purchased it, a publisher who ran his business out of the Commandery. 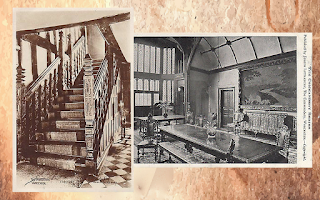 I’ve managed to find a few postcards produced by Littlebury Press around 1910 that featured interior pictures of the Commandery. The publishing house continued until 1973 when the last owner decided to retire. The Commandery was converted into a museum run by the city of Worcester and while for many it's associated with the English Civil War, the depth and richness of its history transcends this period. The museum has an excellent audio tour that allows you to explore every part of the building and step back into time as you explore each room. Take a wander through the kitchen gardens and remember that at one time, this was a place where people prayed, loved and died. 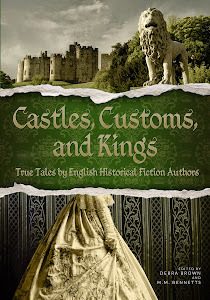 Cryssa Bazos is historical fiction writer and 17th century enthusiast with a particular interest in the English Civil War. She recently spoke before the Battle of Worcester Society in the Great Hall of the Commandery. 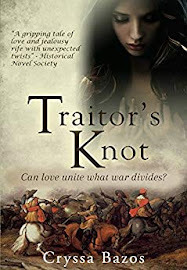 Her debut novel, Traitor's Knot, will be published by Endeavour Press and is expected to be released early 2017. 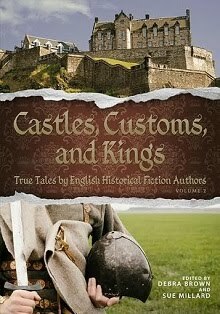 For more stories about the English Civil War and the 17th century, please visit her blog cryssabazos.com. Follow Cryssa on Twitter (@CryssaBazos) and on Facebook. Christmastide: It's not over yet!